In the boreal forest, winter temperatures routinely drop to 30 degrees below zero. Birds that spend the winter in this harsh domain rely on remarkable adaptations to survive. The Spruce Grouse is one such bird. Most Spruce Grouse remain here all year. In the snow-free summer, they forage on the ground, eating fresh greenery, insects, and berries. But in the snowy winter, the grouse live up in the trees, eating nothing but conifer needles. Lots and lots of needles. Because conifer needles are both low in protein and tough to digest, Spruce Grouse grow a bigger digestive system. A grouse's gizzard, which grinds food, may enlarge by 75%! In the boreal forest – the broad expanse of forest lying south of the Arctic – winter temperatures routinely drop to 30 below zero. [Chill, winter wind] Birds that spend the winter in this harsh domain of spruce, pine, and other conifers rely on remarkable adaptations in order to survive. So remember the hardy Spruce Grouse this holiday season. 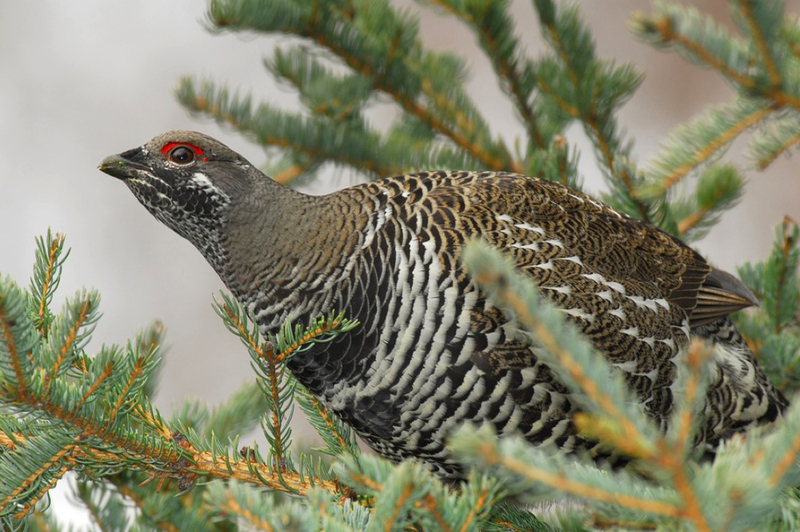 [Spruce Grouse clucking calls] As you stand back to admire a Christmas tree, somewhere in the northern forest a grouse is nibbling away at such a tree – one needle at a time. Bird sounds provided by The Macaulay Library at the Cornell Lab of Ornithology, Ithaca, New York. Spruce Grouse  recorded by H. Lumsden. Ambient created from Boreal Chickadee  recorded by C.A. Marantz.